(11-01-2017, 09:55 AM)MidTowner Wrote: wdemaiter posted a comment about a proposed HIP development for 741-751 King Street West (right across from Central Market), 30,000 square feet of office space and 170 rental units. There is already an office building at 749 King Street West. The other addresses are houses which have been converted to office space. 170+ new neighbours in Midtown would be exciting here! Even more window frames going in today, and they've got some glass panes stacked against the wall too. I never noticed how similar the construction of this building is compared to the current Thalmic building. If the paint is cleaned off of this one, they'll end up looking like quite the neat pairing. Nice photo, but the wrong thread. A glass walkway/pedestrian bridge across the back of the parking lot would be an interesting feature. 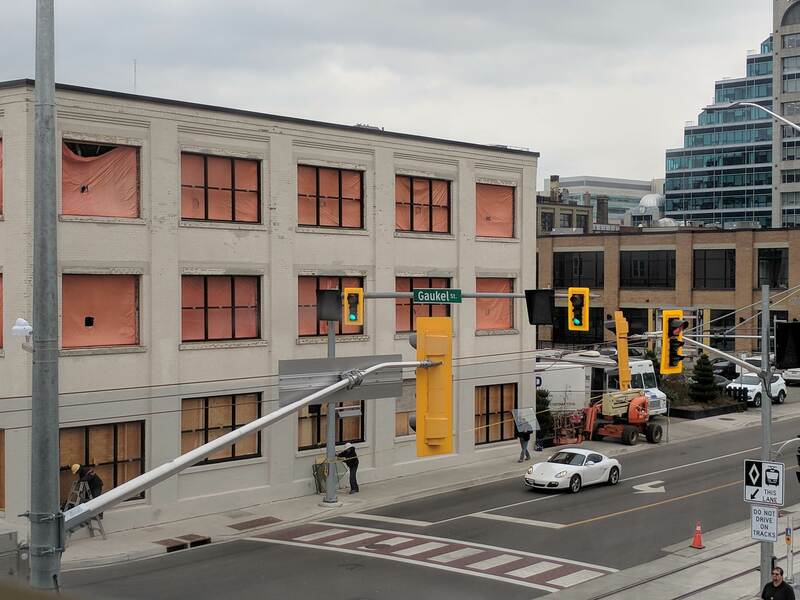 Not sure if this article was posted before (August 30, 2017), but it describes 3 current projects underway by the Masri O Architects in Downtown Kitchener, 1 of which is the American Block, the others I didn't realize were active projects. Every time I see the paint job on the smoke stack though I can't help but think that someone can't count (1,2,3) when in fact it is just the address (132). Has a tenant been announced yet? Chosen, but not announced. At least for the one side — the space has been divided into 2 offices and is being custom-built for each. THANK YOU FOR POSTING THIS PHOTO! I was always confused when there was talk of keeping the smoke stack. Here is a link to the previously mentioned Exchange Magazine article 'Midtown Movement '. Looks like the new Downtown LCBO will involve an expansion of the premises (lots of room out back). It will be interesting to see a rendering in due course - if it's a full demolition, they're going to have to "split" the existing structure, which extends all the way down to McCabes. I've always wondered, given the varying depths of the storefronts, whether the current brick facade wasn't added to existing structures at some point. I was surprised to see in the Record that the congregation of Trinity United is now moving to their new location, having decided this summer to sell the church unconditionally. The Record article seems to imply that the sale of the building may be close.